Get the Military Families Blog widget and many other great free widgets at Widgetbox! The most important step you can take is to Get Out of Debt - Now! Debt Free = Worry Free. These Debt Free Resources and Debt Free Help can help you get started on the right path. VA Home Loans can help you save money when you buy a house. Legal Assistance Attorneys (JAGs) can't tell your command the purpose of your visit. Credit Cards -- Blessing or Curse? Free Annual Credit Report - Don't get ripped off! Why Your Credit Score Matters more than you think. Rent or Buy? Should Military Families Consider Buying a Home? Should We Rent or Buy a Home? 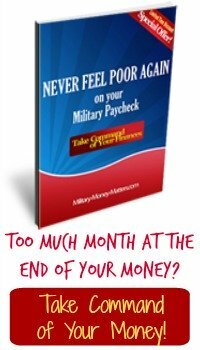 Which is Better for Military Families? We've Decided to Buy a Home!! What Does a Government Shutdown Mean to Military Paychecks? Members of the House and Senate Get Paid but I May Not? USAA Membership Benefits and Services can help you save money on insurance, banking, loans, and more. Buying a Car? USAA has an app for that! USAA Auto Circleexpands on the USAA car buying service to provide a seamless process to find, finance, and insure your next new or used car, online or on your iPhone. No more haggling with a dealer over price. USAA Home Circle - Home Buying Made Easier - lets you shop for your new home (whether you're buying or renting), complete your mortgage application, and obtain homeowners or renters insurance, all on your computer or smartphone. SBI Helps You Build a Web Site that Works! Free tax help for military families. More military families qualify for IRS economic stimulus payments. Military Spouses are Heroes, too! Divorced Parent's Consent to Move Children? Halloween Safety. Halloween Safety Tips. Troops Warned to Be Vigilant - in the US! Tell the anti-military activists they've gone too far! I Support the Troops But Not the War - BS! LtCol Chessani Board of Inquiry wraps up. Sears Heroes at Home Not Fair!! Happy Valentines Day to Our Troops! Happy Holidays to the Troops! Happy Holidays & All My Love! You Are The Best & Bravest! To Any/Every Soldier: Merry Christmas! Thanks For Giving Me & My Family a Life to Live!!! Words aren't adequate...but that's all we have. Thanks for doing the tough jobs that few of us would or could do! God bless you guys and girls! Thank You Veterans for your selfless acts of courage. Thanks from the bottom of my patriotic heart! To Those who serve, have served and those that gave it all !!!!!! Are there any honorable veterans charities? Check out veterans charities before donating. Here's a good source. How can I help veterans charities on a limited budget? How to help local wounded warriors? Requesting donation to charity with free gifts? Want to be removed from charity mailing lists? Here's how. You can stop unwanted charity calls from telemarketing services. National Vietnam Veterans Foundation, Inc.
United Veterans of Florida, Inc. Ask your own questions about veterans charities. Medal of Honor Recipient Jason Dunham's mother has message for troops. Army Spc Monica Brown, a teenage medic from Texas, earns Silver Star Medal in Afghanistan, only the second woman since World War II to receive America's third-highest award for valor in combat. AO2 Marc Lee (SEAL), USN became the first Navy SEAL to give his life in Operation Iraqi Freedom, receiving the Silver Star Medal posthumously for standing in the line of fire three times to provide a diversion while a teammate was rescued from a Ramadi rooftop. Army SFC Michael Loetz awarded Bronze Star Medal for Valor after saving the life of an Afghan truck driver under fire in 2007. At her christening ceremony, USS New York (LPD-21)is already demonstrating her toughness. USS New York sets sail for commissioning in New York City. USS New York arrives in New York. Click the link for ship's visit schedule. Amid a gala celebration, USS New York makes a splash in the Big Apple. The largest re-enlistment ceremony in US history takes place on the 4th of July in Saddam's palace in Baghdad, as we celebrate our freedom, and that of Iraq. Before You Go, a musical tribute to World War II veterans. Little Rock teacher Martha Cothren, daughter of a WWII POW, teaches a valuable lesson about freedom. Popular MilBlogger Andy Olmsted was determined to make a difference in Iraq. Navy pilot's open letter to the terrorists. Where do we find such men and women?" Can Mantras Help with Post-Traumatic Stress? VA assigns Transition Patient Advocates to assist wounded veterans and their families. VetConnect provides a helping hand to wounded service members making the transition back into their communities. Former Blue Angel Boss reports on the Republican National Convention. Harvard Trial Lawyer for McCain. Ronald Reagan is Back says his son Michael. From the moment she was announced as John McCain's running mate, the question has been, "What is Sarah Palin's Experience?" Another radical connection: Who is Khalid Al-Mansour and what is his connection to Barack Obama? Obama and Odinga: Change we DON'T want! Obama declines appearance at Military Town Hall to body-surf in Hawaii! Obama tells reporters, "Lay Off My Wife"! Congressman Murtha refuses to meet with Iraq vets -- his office calls Capitol Police when a Blue Star Mom gives them a piece of her mind! Michelle Malkin's Feb. 6 article titled, "Berkeley vs. America, Again"
San Diego businessman Brian Dennard's letter to the Berkeley City Council announcing his boycott of anyone doing business in Berkeley, and his appeal to all other companies and individuals with whom he does businesses to follow suit. Memo from the Berkeley Peace and Justice Commission to the City Council recommending the anti-military action, going so far as to "encourage all people to avoid cooperation with the Marine Corps recruiting station, and applaud residents and organizations such as Code Pink, that may volunteer to impede, passively or actively, by nonviolent means, the work of any military recruiting office located in the City of Berkeley." Berkeley Chamber of Commerce Weak-Kneed Response to businessman Brian Dennard's letter. Thanks to the efforts of Move America Forward, with the support of readers like you, the FBI will investigate the attacks on military recruiting centers around the country. Admiral William J. "Fox" Fallon, CENTCOM, resigns. Let your voice be heard. Here's how to contact your government officials. What is an RSS feed, and how does it work? Send us your most challenging money issue.